Google acquired AdMob, a mobile ad company well-known for its innovative solutions to monetize iPhone apps and iPhone-optimized web sites. "AdMob is the world's largest mobile advertising marketplace, offering solutions for discovery, branding and monetization on the mobile web." "Publishers and developers are increasingly searching for ways to make more money from their content in the rapidly evolving online mobile space. Google is working hard to provide those means of monetization so that mobile content can grow as quickly as we'd all like it to. AdMob accelerates this process for us with their talent and technology," explains Google. "Google currently makes a very small amount from mobile ads relative to our overall revenue, but the prospects for this space are excellent." In the past year, Google has launched many feature that improved mobile ads: a new search ad format for iPhone and Android phones, ads for mobile apps, better AdSense ads for smartphones. "Despite the tremendous growth in mobile usage and the substantial investment by many businesses in the space, the mobile web is still in its early stages. We believe that great mobile advertising products can encourage even more growth in the mobile ecosystem. That's what has us excited about this deal," mentions a Google blog post. Google paid $750 million for AdMob, the third biggest Google acquisition after DoubleClick ($3.1 billion) and YouTube ($1.65 billion). You gotta love the timing of Google - having a recent release of Android powered Phones then buying this mobile-advertising firm. 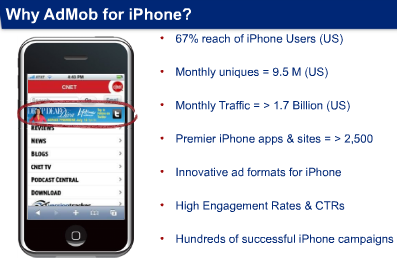 Isn’t iPhone Apps just a small part of AdMob’s business? I think most of it is mobile Web. It seems Google is trying to grab all famous site, few months back they have purchased a voice chat company so called Gizmo5 and now this they have purchased Admob. Hope Google will provide improved services to the end users.